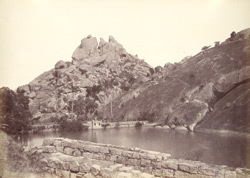 Photograph of a tank at Chitradurga, taken by William Henry Pigou around 1855. Chitradurga was a famous hill-fort town under the rule of a feudatory dynasty of Vijayanagar called the Nayak Paleyagars. The massive 'Palace of Stones' fort contained many buildings and many temples set in the rocky surroundings on the hill as well as water tanks like the one in this view.